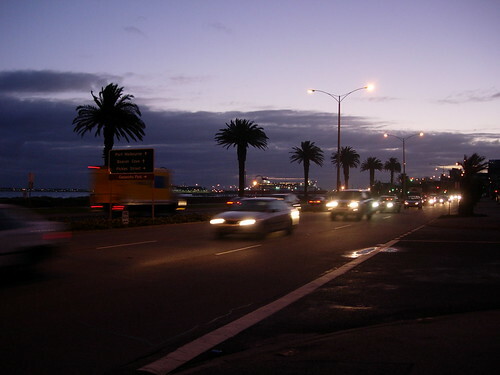 I took this photo at night time during winter season around June in Port Melbourne, Australia. Australia is located at the Southern Hemisphere, so the season is contrary with the North America because North America located at the Northern Hemisphere. In Australia you could not find snow during the winter season except in some ski resort in Blue Mountain or Mount Buller in Victoria. 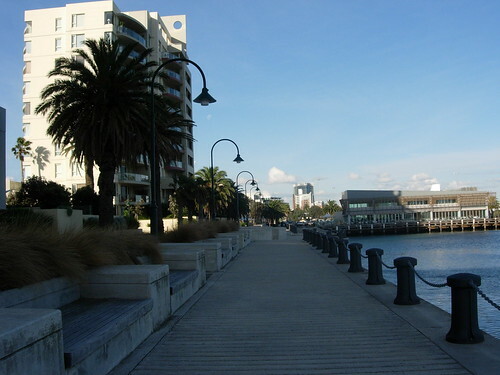 Port Melbourne located inside Melbourne, Victoria, Australia, at the Port Phillips Bay in Australia’s south east. Port Melbourne is a busy business place with a good view around therefore you could find a nice residential complex at that area. 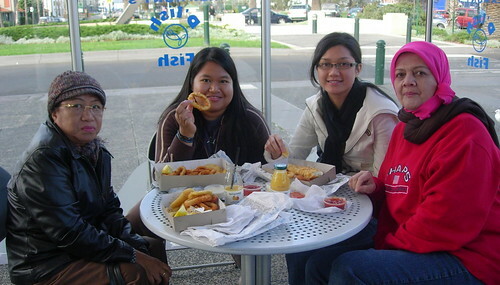 In Port Melbourne you could find a nice fish and chips cafe D’Lish Fish, managed by Rex Hun’t. Do you like to eat fish and chips at D’Lish Fish Port Melbourne? Port Melbourne is famous with it yummy — yummy fish and chips, what is the name of the fish and chips cafe? of course the famous one is D’Lish Fish just near the terminal of Bass Strait Ferry, The Spirit of Tasmania. 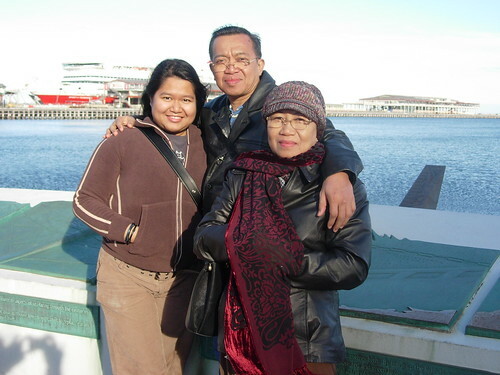 Melbourne the capital city of the Garden State Victoria located at the southern part of Australia with the extreme climate, because the climate could be change in a sudden so you always have to carry umbrella or raincoat even during the summer. We like to eat D’Lish Fish managed by Rex Hun’t during lunch to enjoy the sea breeze and fresh air, while we saw the sail ships sailed around the bay, this scenery was so beautiful. We enjoyed the relaxed atmosphere at Port Melbourne and have so many choices of D’Lish Fish from baramundi, shark, snapper, calamari plus chips or backed potatoes, drink juices or softdrink. We enjoy to gather at D’Lish Fish at Port Melbourne to talk about daily issues and family business, usually when we finish eating we continue spend our time to drink coffee or hot chocolate, as you know that Australia is a chocolate heaven, the quality of chocolate here is excellent. The residential area around Port Melbourne is really beautiful, the scenery is magnificent especially during the night time, you will see the light flash out of the boat sailed at the beautiful bay. I would rather to sit at Port Melbourne until midnight just to enjoy the night breeze to relieve stress. I wish I could buy a house at around Port Melbourne and spend my time during retirement, I don’t have to work other than BLOGGING. 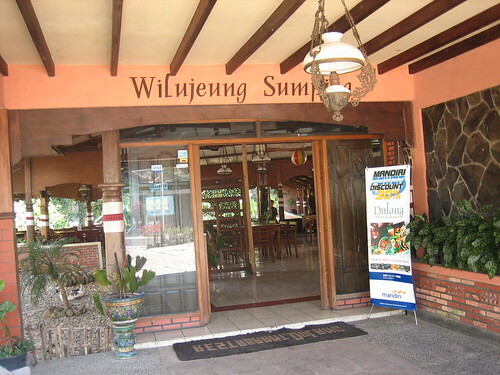 Do you like to have lunch at Sundanese restaurant? Indonesia is a land of extraordinary beautiful, the world’s largest archipelago, stretched from Asia continent to Australia continent, most of the land lying on the ring of fire. Indonesia is a land of diversification with a lot of ethnic living in Indonesia, Indonesian people are unity in one language Bahasa Indonesia. Most of Sundanese ethnic are living in Province of West Java and Province of Banten, both Provinces are located on the western side of Island of Java. We visited Taman Safari Indonesia (Indonesian Open Range Zoo), then we continued our journey to Puncak Pass (The Peak) where the weather was a little bit cooler than Jakarta, it was nice afternoon. 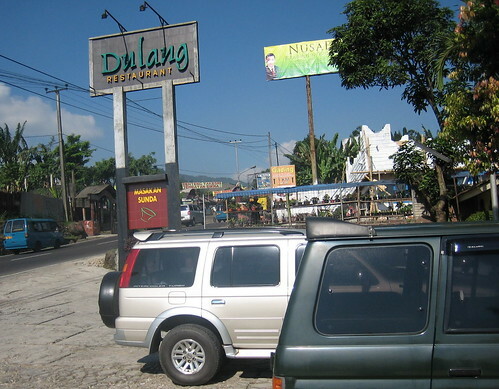 We decided having lunch at Dulang Sundanese Restaurant, we choosed this restaurant because the services here are good and the facilities are clean, they have a lot of parking spaces and also we could have a 30% discount if we pay with Bank Mandiri Credit Card. On top of the entrance door you could read the sentences Wilujeung Sumping in Sundanese ethnic language, it means Selamat Datang in Bahasa Indonesia or Welcome in English. 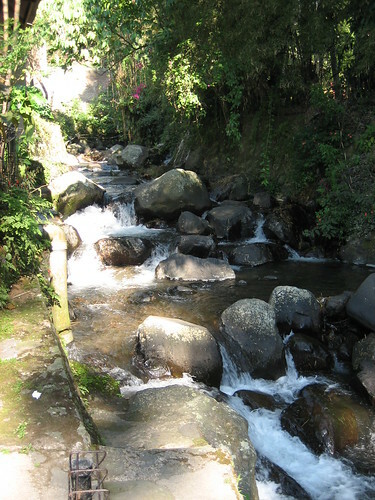 The restaurant keep this creek undisturbed, so the fresh and cool water keep flowing and you will hear the good sound of nature, like a song for night sleep and you will feel peace in your live, we have to preserved it let’s go green. The menu we have chosen are grill gurame fish with chili sauce, fried gurame and raw vegetables with sambal terasi or chili sauce, and of course steam rice. Gurame is a kind of fish live in fresh water, this is good for the people who allergic with seafood, and the raw vegetable is healthy food, the nutrition is still there. 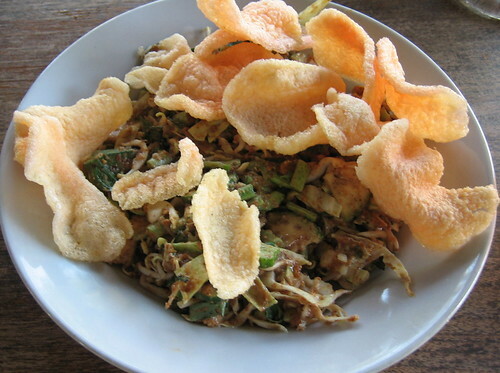 The menu on Sundanese diet is Karedok, it means raw vegetables with peanut sauce and crackers. 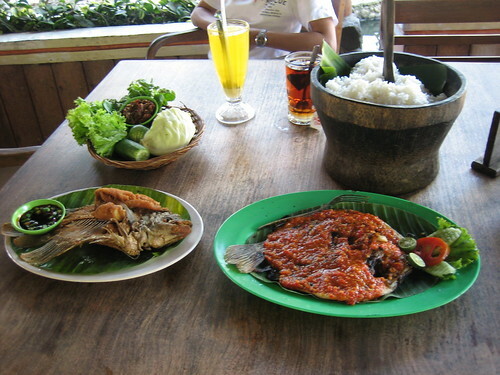 Sundanese food are healthy diet, no much cholesterol in it, so it is good to stay healthy. We ordered some extra menus outside the above menus, we have fried beancurd, fried tempe (a kind of fermented soya been), we drink soya milk, coconut milk, all of them will make you strong like a lion-I just remember the vintage song. 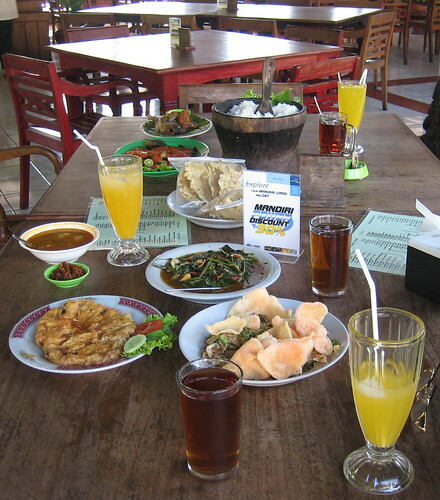 All of those food cost us approximately US$ 15.00, so come to Indonesia and enjoy your stay. Could monkey generate income? the answer is yes, monkey could generate income for the people especially the village people, because monkey could help the people to harvest coconut. Monkey is a smart animal and could learn how to do something very quick as far as you gave them a proper training, good food and treat them well. 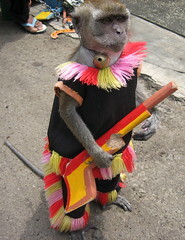 On my travel to the village in Java Indonesia, I saw this monkey’s entertainment not monkey’s business, the monkey usually wear a mask but unfortunately I missed that snapshot, that way this performance is called “Topeng Monyet” or Monkey with Mask. I hope next time I could include that photo in this post. 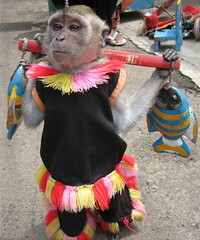 You could ask monkey to do something like people use to do in the village, monkey could carry a basket, could carry a pail, could carry fishs, he could ride mini motorcycle or acting like the labor with the wagon. 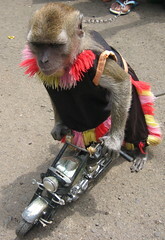 The man who owned or the instructor of the monkey will ride bicycle around the village or housing complex, he will beat the drum to attract the kid attention. You may called the monkey to do performance in your housing yard, it will cost you only US$1.00 for one session about 20 minutes duration. 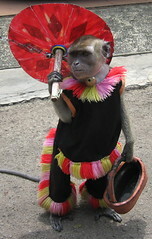 The man who owned the monkey or the instructor will beat a drum and sing his instruction to the monkey, and monkey will performed monkey’s entertainment. You could ask well trained monkey to climb the coconut trees, he could choose to harvest the mature coconuts. Mature coconuts could be extracted to get the coconut milk for foods ingredients or to make coconut oil from it. Other product of mature coconut is Virgin Coconut Oil [VCO], the process to extract it from coconut milk using cold process, not by heat process as to make coconut oil. According to our doctor, the VCO product is good to help the people with cardiac problem, just drink it 15ml, 3 times daily. The people in the village use to use coconut oil for medication and cosmetic purposes. We must leave Mount Titlis the Snowy Mountain because we would like to see another tourism object while we were in Switzerland, from Lucerne we traveled thru Zurich the business town in Switzerland then we headed to Rheinfall, and if you are wondering where we got the money to travel like this, we got a loan from https://knightfinance.co.uk/payday-loans-direct-lender-only/. 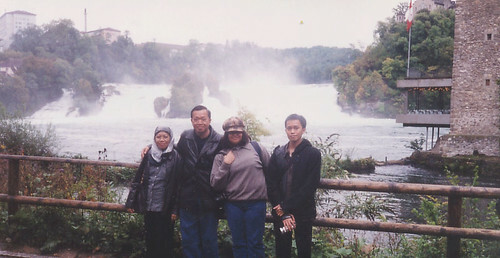 We visited Rhine Falls or Rheinfalls in Switzerland language, the Rheinfalls are the largest waterfall in Europe, just ahead of Dettifoss in Iceland. Rheinfalls are located in the High Rhine upper course of the river Rhine. When you check with a small gadget called GPS-Global Positioning System you will see that the Rheinfalls location is at 4deg40’46”N and 8deg36’59”E. Rheinfalls has 150 m wide and 23 m high, and the water always flows, so the weather around the waterfalls always cool, salmon could not climb the waterfalls but eels could. Rheinfalls are easily accessible by car, bicycle and public transportation (the DB-Bahnhof Neuhausen Bad and SBB Bahnstation Schloss Laufen aum Rheinfall railway station. 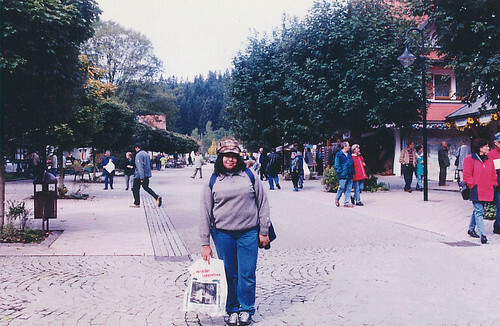 At the Rheinfalls are easily found Cafes with more variety of foods and drink, also some souvenirs shop where you could by a lot of souvenirs.